Capital One® offers customers innovative and exclusive features. In addition to the security of $0 Fraud Liability and standard Visa® and MasterCard® benefits, you can also personalize your card with your favorite pictures. And you won't get No Hassle Rewards anywhere else. 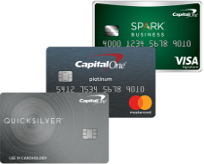 Here are some featured cards from Credit Karma’s partner, Capital One. † The Minimum Credit Needed provided by lenders represents their estimate of the minimum level of credit required to be eligible for the product. There is no guarantee that you will be approved by the lender or that credit will be extended to you.